When he walks into the room everybody's head turns...but his. He has no neck. I only steal from people with the best stuff. I wonder if it would be possible to get female heads on somehow? The Playmates sculpt for their 9” Uhura is fantastic. 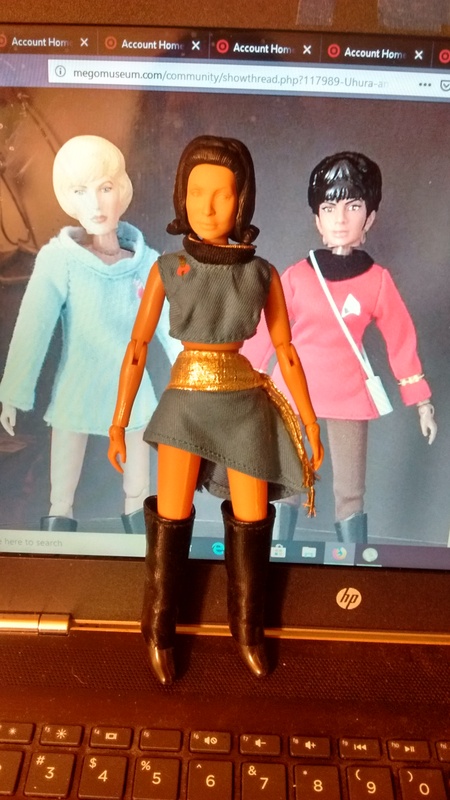 I have a shrunk Captain's Woman head on an original Mego body. It fits great, as a shrink. Full size was too big, in my opinion. She just needs to get painted, which I can't do anymore. An Uhura shrink would be awesome! I used the naphtha shrink method, which requires no repainting. As pointed out in the thread, the new Mego body should make it even better. I just reread your post and realized why I haven't been having any luck with Naptha. I didn't know you could leave the head in for days. I've been chickening out and pulling them after a couple of hours. I have a few of these in progress, the Naptha will be flowing tonight. Those look amazing. The only thing I don’t like is the neck size. I wonder if there would be any way to do something about them? Questions regarding the female necks: Would it be possible to trim/sand/buff away the neck--leaving a rounded head like classic Mego? Could this be done before or after soaking/shrinking? Lt. Moreau looks better because she has long hair and the neck doesn't stand out as much.